10'6 x 28 x 5.5 x 206L Bump Master Read more..
Bump Rider Series: The Bump Rider Series is Blue Planet founder Robert Stehlik’s pride and joy. With extensive experience and knowledge of downwind and open ocean SUP paddling, the Bump Rider Series is designed for maximum fluid dynamic efficiency. The Bump Riders have been refined over many years, yielding the perfect outline, rocker and rails for optimal downwind and open water racing performance. The noses on the Bump Riders are a rounded planing shape to capture the best of both surface texture displacement and surface glide. The full rails contribute to stability and enable the board to glide effortlessly on bumps. 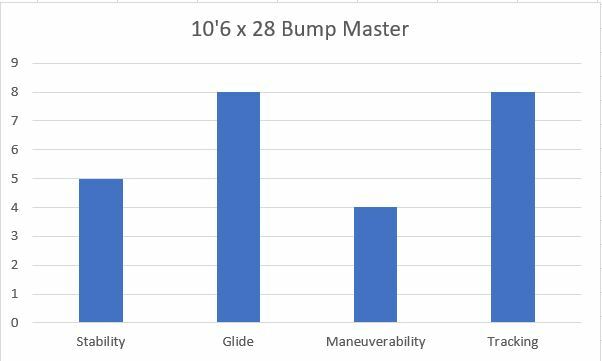 The Bump Rider Series features the following models: 10’6 x 28 Bump Master, 12’6 x 26.5 Bump Chaser, 12’6 x 28 Bump Surfer, 14’0 x 23.5 Bump Racer Dugout Pro, 14’0 x 25 Bump Racer Dugout, 14’0 x 27 Bump Rider Speed, and the 14’0 x 30 Bump Rider Wide.